In Sporting Goods > Bicycles > Show & Tell and Photographs > Show & Tell. Wow! This one blows my mind!!! Such a cool image. I feel like I can climb right inside it. I'm thinking turn of the century. Look at those old bicycle lamp displays... Amazing! This an awesome photo. I was curious about the bike on the left with underslung handlebars. I knew it was not USA, the word tyres on the posters was a give away. I also have never seen that webbing on the sides of the fenders on the bike in the lower front. Maybe for women in long dresses? Good eye Mike, I found this on a quick search. 1910. 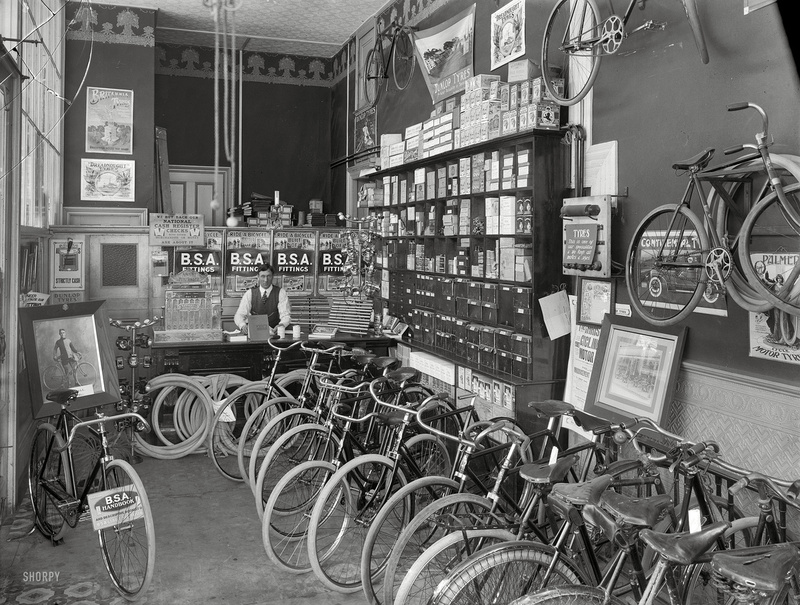 "Cycle shop interior. Christchurch, New Zealand." B.S.A. stood for Birmingham Small Arms. Photo by Steffano Francis Webb. Wow! a treasure trove for old bike nuts! technically, i think this is a sign for a bicycle tire store, rather than a bike shop. regardless, GREAT photo! In 1893 BSA commenced making bicycle hubs and continued to supply the cycle trade with bicycle parts up to 1936. BSA bought The Eadie Manufacturing Company of Redditch in 1907 and so began to manufacture the Eadie two speed hub gear and the Eadie coaster brake hub. BSA also signed an agreement with the Three Speed Gear Syndicate in 1907 to manufacture a 3 speed hub under licence. This was later classified as the Sturmey Archer Type X. BSA introduced a 'Duo' hub in the late 1930s which was capable of one fixed gear and one gear with a freewheel. All BSA hub gear production temporarily ceased in 1939, until they recommenced making their 3 speed hub around 1945. The Eadie coaster hub made a brief return in 1953 on two BSA bicycle models. BSA forever ceased production of their hub gears in 1955. I liked it because my father had a bike shop back in the eighties,bring me back memories. That goes way back before they used carbon to make the tires black. For AzTom ... the bike in the lower left corner is a racing model built for a banked board track. You can see a picture of a racer behind the bike. I used to race road and track back in the '70s and immediately recognized the style.